The old town of Ronda in Spain's Andalucia region is located in the centre of a high plateau surrounded by a beautiful landscape of mountain ranges. 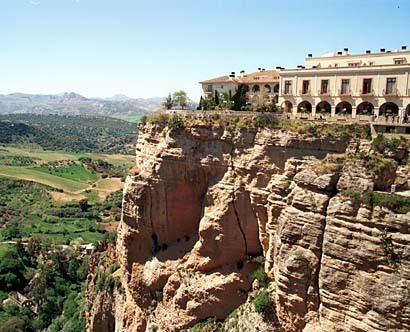 The wonderful town is divided by a river gorge, El Tajo . Sheer rock faces drop for 426 feet. The two halves are linked by a stunning bridge. Three bridges span the gorge connecting the two areas of the town. The oldest bridge is of Arab origin, the Puente Viejo dates from the 17th century . 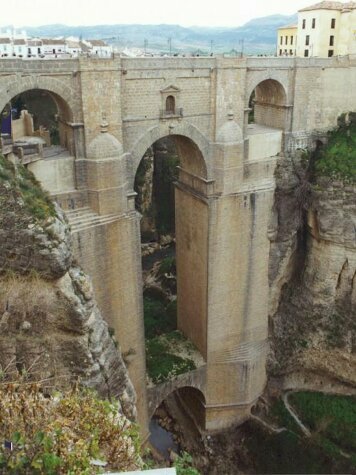 The Puente Nuevo ( New Bridge) built between 1751 to 1793 .